Process Meter is an auxiliary application for HostMonitor, however it can be used independently as well. Process Meter is included into Advanced Host Monitor package (since version 7.20) and can also be downloaded separately at the download page. Each process represented by a bar; red colored bar indicates process that uses resources over specified limit. You may specify limits using menu View ->Set limits. When you are using HostMonitor to start Process Meter, HostMonitor sets resource usage limit using test properties (Dominant Process test). You may click on the bar to see detailed process information. CPU usage - shows amount of CPU time (%) used by each process. If there are several CPUs installed on the system, CPU load can be over 100%. Handles - this menu item tells the application to show the total number of handles currently open by the processes. Handles number is the sum of the handles currently open by each thread in the process. Threads - tells ProcessMeter to show the number of threads currently active in each process. An instruction is the basic unit of execution in a processor, and a thread is the object that executes instructions. Every running process has at least one thread. 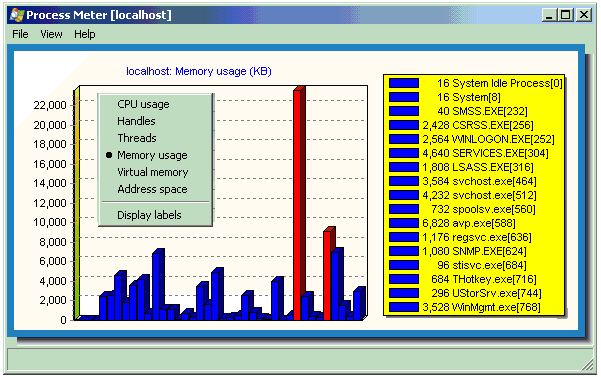 Memory usage - shows the current number of kilobytes (KB) in the Working Set of the processes. The Working Set is the set of memory pages touched recently by the threads in the process. If free memory in the computer is above a threshold, pages are left in the Working Set of a process even if they are not in use. When free memory falls below a threshold, pages are trimmed from Working Sets. If they are needed they will then be soft-faulted back into the Working Set before they leave main memory. VM size - this menu item tells the application to show the current size in kilobytes (KB) of pages allocated that are only accessible to the process. Address space - shows current size of the virtual address space that processes are using, not the physical or virtual memory actually used by the process. Use of virtual address space does not necessarily imply corresponding use of either disk or main memory pages. Virtual space is finite, and by using too much, the process might not be able to load libraries. Refresh - tells Process Meter to collect up-to-date information from target system and update the chart. Auto refresh ON - using this menu item you may setup Process Meter to update the chart on regular basis, e.g. every 5 sec. Auto refresh OFF - use this menu to disable "auto refresh" option. Display labels - turns on/off chart labels. Label - a mark near a bar on the chart. A mark consist of a colored rectangle with a process name on it and a line that indicates which bar corresponds to which mark. Note: when you point mouse cursor on some bar, Process Meter will display corresponding process name in the status bar (regardless of "Display labels" option). Set limits - brings up "Set limits" dialog window. Using this dialog you may setup threshoulds separately for each "view" mode. Process Meter will show red colored bar when a process uses resources over specified limit. E.g. you may setup application to use red color when a process uses more than 30% CPU, more than 1100 handles or more than 90,000 KB of memory. Process Meter can be started as an independent application or it can be launched by HostMonitor: Dominant Process and Process test methods offer "Process Meter" popup menu item that allows you to launch application to check specified system. In such case HostMonitor sends test parameters to Process Meter. Process Meter allows you to request local (the system where application is running) and remote systems. To connect to the remote system you may use GUI or command line parameters. If you have already started Process Meter and you need to connect to another system, use menu "File" -> "Target host". In the connection dialog you should specify the hostname (or IP address), login name and password. You may specify connection parameters in command line so that Process Meter connects to specified system right after startup. Also you may start Process Meter on Windows 98 or Windows NT 4.0. In such a case you should install the WMI Core software package (available at Microsoft's web site). Please note: WMI CORE for Windows 95/98/NT requires Microsoft Internet Explorer version 5 or later. In order to remotely monitor a Windows XP SP2 machine, you will need to configure the built-in firewall. If the Windows firewall is enabled and if it hasn't been configured to accept a WMI connection, Process Meter (and HostMonitor) will not be able to connect to the system. In such a case, HostMonitor shows "The RPC Server is unavailable" error. To configure Windows XP firewall to accept WMI connections, you need to enable the "Allow remote administration exception" group policy entry. This setting can either be configured on the local group policy of a machine or globally by configuring the global Group Policy settings of an Active Directory domain. When you purchase an Advanced Host Monitor you will get the license for Process Meter at no additional cost. Advanced Host Monitor package is available in several licensing options: Starter ($199), Professional ($350), Advanced ($599), Enterprise ($1299) and Enterprise with Lifetime Updates ($2499). You can order by credit card, Switch and Solo debit cards, check/money order or wire transfer order. If you are concerned about submitting your order and/or credit card information online, you may register the Advanced Host Monitor via phone, fax or postal mail.